There are some "go to" resources that we turn to time and again for information about schools and other subjects. You may already use them, but in case you don't and in the hope you find them as helpful as we do, we thought we'd bring a few of them to your attention. The terrific website InsideSchools.org has reorganized its resources, making it easier to find information on such topics as free programs for students and families, a wide variety of publications on subjects such as how to find elementary, middle, and high schools, and tools for such important topics as How to Change Schools, Special Education, and English Language Learners. 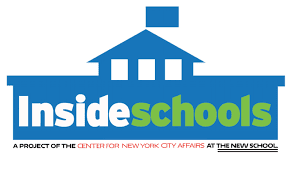 Inside Schools is always a helpful resource for information about specific New York City Public Schools, with search options popping up right on the home page. But it isn't always up to date, since it depends on school visits to each of the schools it reviews. Parents should also take a look at the NYC Department of Education website, where more recent information (without the narrative discussion that makes InsideSchool's reviews so helpful) can often be found. In fact, the major limitation of InsideSchools is that it only deals with New York City Public Schools. Families who live outside of New York City can often find guidance on the website GreatSchools.org., which is a national nonprofit with information on both public and private schools nationwide. Another resource we like is the steady stream of emails from the A.D.D. Resource Center, headed by Harold Meyer, a founder of CHADD of New York City (Children & Adults with Attention-Deficit/Hyperactivity Disorder), the national volunteer-based organization. This resource isn't for those who are protective of their inbox - Hal Meyer is prolific and can send a half dozen or more emails each day about topics relating to attention and learning. But most of his emails are interesting and some are really excellent. You can sign up for his e-list from his website.